Most companies will offer different products for cleaning different areas of your home in efforts to have you spend more money. These products take up space to store and can definitely eat into your household budget. Some remain unused for months or years, only to be thrown away. To avoid this, look for all-purpose or multi-purpose cleaning products for your home. The ingredients used to clean your floors, countertops, bathroom sink and bathtub are generally the same. Some great multi-purpose cleaners include: Windex multi-purpose vinegar cleaner, Mr. Clean multi-surface antibacterial spray and Lysol all-purpose cleaner, to name a few. Paper towels can be a convenient way to wipe away messes, but are costly. A family of 4 can use 3-5 paper towel rolls a week for wiping down the kitchen, washing up before meals and before cooking, washing and drying fruits and using as a napkin at meal time. Alternative cost saving approach is to use reusable towels like J-cloths and dishwasher friendly microfiber cloths instead. All cleaning cloths should be rinsed and hung or laid out flat to dry to reduce the occurrence of harmful micro bacteria. Microfiber cloths are small and take very little space in a standard washing machine. To minimize cross contamination, purchase different shapes and colors of wash cloths for the home. Designate the cloths by function. For example, one cloth can be for wiping counters while another can be for wiping spills on the floor. If you are able to implement a good system, you can save a lot of money by making this one change. There are advantages to switching to light emitting diodes (LED). Even though LED lights cost around $5-$10 per bulb, at an average life span of 25,000-hour they last 3 times longer than compact fluorescent lights (CFL) and 20 times longer than incandescent light. LED lights also consume a lot less energy, keeping your home cool and lowering your electricity bill by 70% compared to incandescent light and about 25% compared to CFL lights (Source). If you do not want to spend $8 to $10 a bulb for lights in your home, even changing the most frequently used lights in your home can save you money each year. The ingredients in homemade cleaning supplies vary slightly depending on the use of a particular product in the home. Water, vinegar, essential oils, borax, lemon, rubbing alcohol, soap and baking soda are some of the main ingredients found in home made cleaning products. Making your own cleaning supplies saves you even more money than buying all-purpose cleaners. They also provide a chemical free (or at least reduced) way of cleaning. Examples of cleaning products you can make at home include: laundry detergent, glass cleaner, bathroom and kitchen cleaner, stain remover and fabric softener. Many major retail stores like Walmart, Safeway, Coop and CVS will carry their own cleaning brands. Most of these brands are comparable in quality to more expensive brand name items. Buying store brand products can save you a few dollars each shopping run. 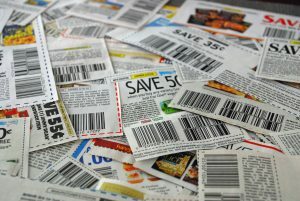 Store coupons are mailed out to households on the Thursday and Friday of each week. Some flyers are packed with coupons, discounts or extra loyalty points for certain products. Check flyers, newspapers and e-coupons for savings before shopping. Adjust your shopping list to account for products you are comfortable switching and you can save some money. Buying in bulk can save you money. 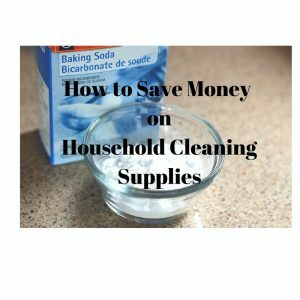 Whether you purchase ready to use cleaning products, or make your own, buying in bulk helps you save. If you do make your own products it allows you to save twice; for the bulk purchase and for the inexpensive ingredients. Most cleaning products have a highly concentrated amount of chemicals that is not only harmful for the environment, but also your health. If you opt out of making your own cleaning products, then adding water to store bought products not only reduces the chemical concentration with each use, it also saves you money as you increase its supply. There are different items in the home that can be reused for household cleaning. Old clothes can be used as cleaning cloths, Tupperware that have missing lids or are relatively worn out are great to use for holding soap and water for cleaning. Mugs with broken handles can be used for rinsing tubs, sinks or watering plants. If you get creative, there are many things in the home that can be repurposed and used one more time before being disposed. Manufacturers will mail free samples to your home in an effort to gain your business and customer loyalty. Receiving samples from manufacturers can be a great way to supplement cleaning supplies at no added cost. By signing up to multiple websites that offer these freebies, you may be able to save some money. Some website that offer free samples include: com, Hunt4Freebies.com, CanadaSaver.ca and Sample Source Canada. It might be surprising to think that cleaning often can reduce the amount of product used, but it can. By cleaning bathrooms, sinks, tubs, kitchen counters and floors on a regular basis, you avoid having to deep clean to achieve the same result. Deep cleaning that can result from weeks of neglecting house cleaning chores is not only harmful for your health due to overexposure of chemicals, it may require more product to achieve the same result. Hot water is not only harsh to most fabrics, it costs money to generate. The energy needed to convert cold water to hot water can have a sizable impact on your utility bill. By using cold water when washing your clothes in the washing machine you can save some money.